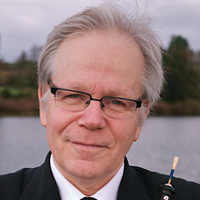 Robert Ingliss is principal oboe of the New Jersey Symphony and The Santa Fe Opera orchestras. He tours worldwide with the Orpheus Chamber Orchestra, with whom he also has appeared as soloist, and is a member of An die Musik, Cygnus Ensemble, and Manhattan Sinfonietta. An avid proponent of contemporary music, he has premiered works by Milton Babbitt, Elliott Carter, Marc-André Dalbavie, and many others. His recording credits and performances on soundtracks for film and television are as varied as they are numerous. He has taught at Columbia University, Sarah Lawrence College, and SUNY/Purchase.